Elizabeth is bounded by Dauntsey Road in the north, Main North Road in the east, Fairfield Road and Ridley Road in the South, and the Gawler railway line in the west. The suburb is named after Queen Elizabeth II. The area began development when the South Australian Housing Trust established a new town to accommodate the growth in immigration, population and industrial development in 1955. During the 1960’s and 1970’s rapid growth took place, following by a decline of population in the 1990’s. There was then an increase in population between 2001 and 2006 as a result of new dwellings being added to the area. Elizabeth is an established residential area, with a large commercial centre. 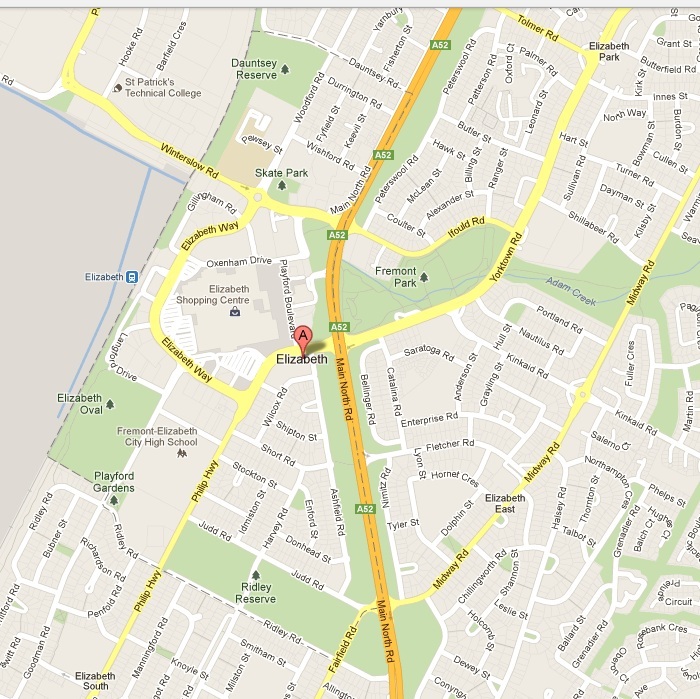 Elizabeth has many major features including Elizabeth Shopping Centre, Elizabeth Aquadome, Elizabeth Magistrates Court, Council offices, TAFE of SA (Elizabeth Campus), Dauntsey Reserve, Hamra Homes Oval (home of the Central District Football Club), Playford Gardens, Ridley Reserve and a number of schools. The median age of people in Elizabeth is 35 years with children between the ages of 0 and 14 making up 18.6% of the population, and people aged 65 years and over making up 14.9%. Of occupied private dwellings in Elizabeth, 64.1% are separate houses, 5.8% are semi-detached, row or terrace houses, townhouses etc., and the suburb consists of 30.2% flats, units, apartments or other dwellings. Out of these properties, 19.9% are owned outright, 25.4% are owned with a mortgage and 50.2% are rented. Elizabeth North is bounded by a line on the southern edge of the Smithfield Army Ordnance Depot in the north, Main North Road in the east, Dauntsey Road in the south, and the Gawler railway line in the west. Elizabeth North is named for the area north of Elizabeth, which is named after Queen Elizabeth II. The area began development when the South Australian Housing Trust established a new town to accommodate the growth in immigration, population and industrial development in 1955. During the 1960′s and 1970′s rapid growth took place, following by a decline of population in the 1990′s due to little change in dwelling stock and a decline in the average number of persons living in each dwelling. Much of the area being redeveloped under the Rosewood Redevelopment project has resulted in recent stock loss. 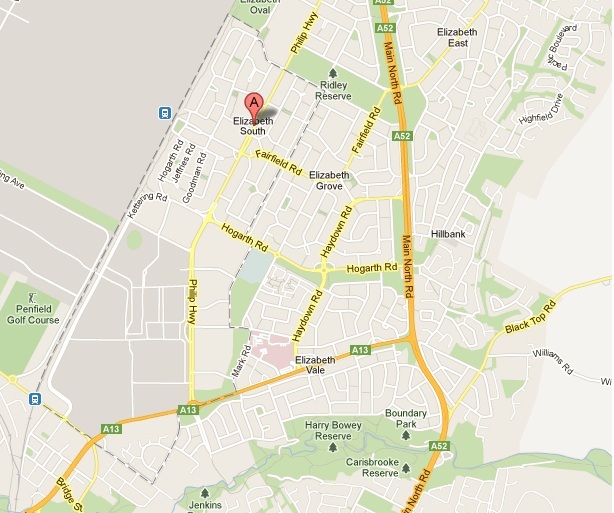 Elizabeth North is an established residential area, with a small commercial area. 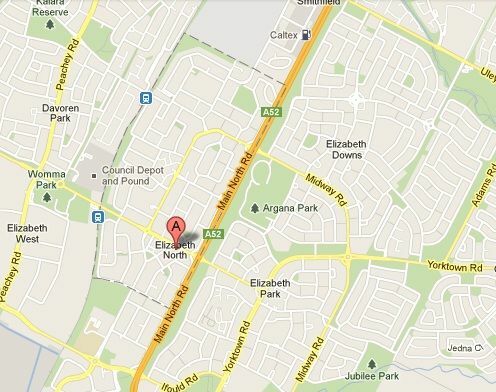 Major features of the area include Elizabeth North Shopping Centre, Broadmeadows Reserve and two schools. The median age of people in Elizabeth North is 34 years with children between the ages of 0 and 14 making up 21.2% of the population, and people aged 65 years and over making up 17.0%. Of occupied private dwellings in Elizabeth North, 42.7% are separate houses, 43.3% are semi-detached, row or terrace houses, townhouses etc., and the suburb consists of 14.0% flats, units, apartments or other dwellings. Out of these properties, 17.7% are owned outright, 26.0% are owned with a mortgage and 52.4% are rented. Elizabeth South is bounded by Ridley Road in the north, Harvey Road, Hogarth Road, Trimmer Road, Oldham Road, Mark Road, John Rice Avenue and Jarvis Road in the east, Porter Street and Commercial Road in the south, and the Gawler railway line in the west. Elizabeth South is named for the area south of Elizabeth, which is named after Queen Elizabeth II. The area began development when the South Australian Housing Trust established a new town to accommodate the growth in immigration, population and industrial development in 1955. During the 1950′s and 1960′s rapid growth took place due to some new dwellings being added to the area, but a decline in the average number of persons living in each dwelling. Elizabeth South is an established residential and industrial area. Major features of the area include the General Motors Holden Automotive Plant, Elizabeth South Shopping Centre and one school. The median age of people in Elizabeth South is 36 years with children between the ages of 0 and 14 making up 22.1% of the population, and people aged 65 years and over making up 17.0%. Of occupied private dwellings in Elizabeth South, 40.8% are separate houses, 52.8% are semi-detached, row or terrace houses, townhouses etc., and the suburb consists of 6.5% flats, units, apartments or other dwellings. Out of these properties, 18.2% are owned outright, 18.3% are owned with a mortgage and 58.5% are rented.